There are many things to consider when buying a new car, and its resiliance and lifespan are indeed important ones. Epoxy resins came into force in the 80’s to make sure that, regardless of the final decision about make and model, your car will be protected from rust and corrosion and you will only feel like replacing it once you get bored of its colour. Epoxies have proved to be an excellent coating against bad weather conditions and the passing of time. Over 90% of today’s cars are coated with epoxy primers before they receive their actual top coat, and it is thanks to them that cars have extended their lifespan and improved its appearance significantly. 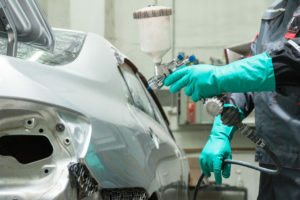 Epoxy primers have three critical functionalities: they protect metal very effectively from corrosion and rust; they provide an incomparable adhesion on metal, so that all parts stay well in place; and, finally, they fill any small voids and cavities so cars can look all smooth and shiny. Ready to hit the road! Munich, Germany – 16 of March 2016: Presentation of a supercar BMW i Vision Future Interaction. 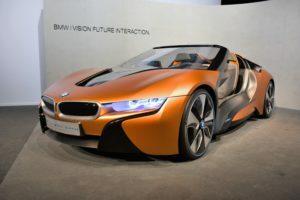 This prototype demonstrates how new cars from BMW will look like in the future. The automotive industry is in constant evolution and, as manufacturers’ work to reduce CO2 emissions and make vehicles lighter, epoxy resins have started to become even more important. Epoxies played a major role in the development of the BMW i-3 e-car, where epoxy adhesive guaranteed safety, efficiency and sustainability, particularly with specific crash requirements. The epoxy chemistry started to replace traditional joinery techniques with new adhesives which can bond multiple materials (such as metal and composites), even in highly-automated processes in serial production. Later on, with the BMW 7series, thermoset reinforced composite materials became a trend for the sustainable production of vehicles. Highly efficient production technologies involving high-pressure epoxy resin transfer moulding and wet compression mouldings reduced production lead times as well the number of components needed. Innovation is an intrinsic part of the automotive industry’s DNA, and epoxies are here to help. Epoxy resins facilitate the protection of car bodywork from corrosion and other damages, in some instances doubling the lifetime of a car. Despite the challenges that alternative driving systems present from a regulatory point of view, different fuel systems give epoxies another push. Resins will be used to encapsulate and seal electronic motors in the increasing number of e-cars. This way, there will be a better heat transmission, electrical isolation and an adequate protection against other chemicals, vapours and humidity. However, the use of epoxy chemistry in the automotive sector is not limited to only a few applications. Far from it, epoxy systems are a major contributor to make cars lighter and stronger, as part of a sustainable and environmentally friendly future. This is a long-distance race and epoxies are ready to get to the finish line.